Terrorist attacks overseas began in the 1980s and continued to increase through the 1990s. Americans still felt relatively safe because terrorists had never ventured to U.S. soil. That changed on the morning of September 11, 2001, when terrorists hijacked four planes. The first plane slammed into the north tower of the World Trade Center in New York City at 8:46 a.m. Initially, people thought the plane crash might have been an accident. Sixteen minutes later, a second plane plowed into the south tower. Balls of fire were seen shooting out of the south tower as smoke billowed from the north tower. Chaos and panic followed as people raced to evacuate the buildings. It became clear that the nation was under attack. At 9:43, a third plane hit the Pentagon in Washington, D.C., killing 125 people. The Pentagon is America’s military headquarters. A fourth plane was believed to be headed for the Capitol building in Washington, D.C. By this time, passengers aboard the plane had heard about the other attacks and understood the threat. They fought back against the hijackers and the plane crashed into a field in Pennsylvania, killing all on board. When the planes crashed into the twin towers, the explosion generated intense fire and heat, causing the steel reinforcements to melt and buckle. Both towers collapsed, sending a rain of concrete, metal, and ash into the streets. Most of the people working in the lower levels of the buildings were evacuated, but 3,000 people, including almost 500 rescuers, died in the twin towers. Across the country, people were in shock as they watched the footage on television. People posted photos of missing loved ones near the site of the twin towers as they waited for news. The Secret Service moved President Bush to secret locations where he worked with Vice President Cheney to plan a response. 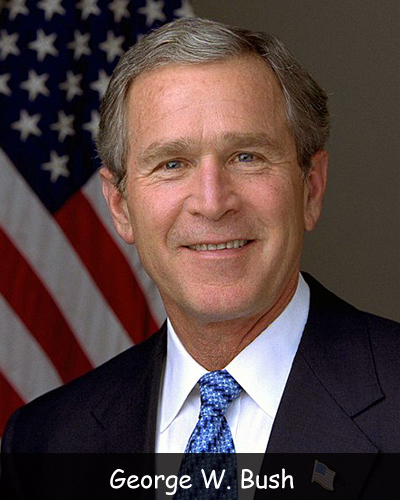 President Bush called the attacks “evil, despicable acts of terror” and vowed to find the perpetrators. A new war against terrorism began. New York City firefighters were seen as heroes for their brave efforts in searching for victims after 9/11. Many of them developed health problems from breathing in the ashes and dust. The terrorists hoped to cripple America’s business and government districts and they did succeed for a while. The stock market closed for four days and experienced the worst crash since the Great Depression. Americans were afraid to fly and the airlines laid off more than 10,000 employees each. The U.S. government gave them loans to keep them afloat. Question: Why did the terrorists attack? Answer: The terrorists had deep religious, cultural, and political conflicts with the U.S. and the western world. They wanted to make a strong statement. Additionally, some terrorists believe that God has called them to start a holy war. They believe that dying for this cause will bring a great reward after they die. To learn more about 9/11 and what happened next, visit Scholastic. Declan, Tobin. " Terrorism in the US ." American History for Kids, Apr 2019. Web. 22 Apr 2019. < https://www.americanhistoryforkids.com/911-terrorism-american-soil/ >.